Tim’s right on the money with this observation – this butcher shop is truely an amazing foodie experience. I would add that they give a strong sense of theatre to the purveying of their meat. Just clever. So, when was the last time you went to the butchers and were inspired to take out you camera and take a photo of the butcher shop because it was simply amazing? What sort of crazy question is this, as for most people the answer is NEVER. The level of themeing of the oldest continuous butcher shop in Sydney Australia is apparent with a 100 year old meat slice on display, butchers cutting timber blocks and even down to the sausage shaped door handle. 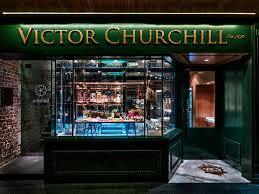 There is a sense of theatre to the point that in one video I recently watched a chef refer to Victor Churchill’s as a ‘department store for meat’.